Home>New Songs>Armani White Songs> Armani White & Sango Link Up On "Casablanco Freestyle"
It's been a minute since we had Armani White on our site. The rapper is undoubtedly talented and he's consistently delivered quality music with every single one of his releases. From his incredible penmanship to his volatile flow, he keeps listeners on their toes for the next bar. Today, he unleashes a brand new single featuring Sango, "Casablanco Freestyle." 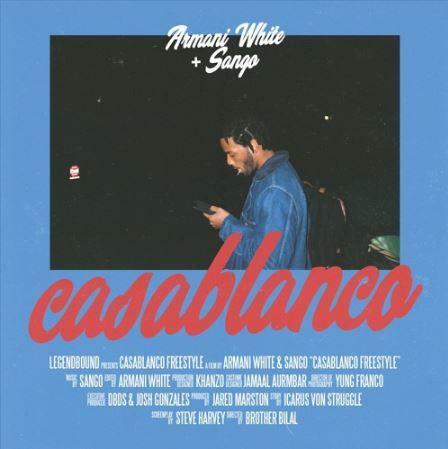 Armani White and Sango connect on the new track, "Casablanco Freestyle." The two of them prove to be an incredible duo and hopefully, they collaborate more in the future. White's distinguished flow compliments Sango's bouncy production extremely well. Aside his collabo with Armani White, Sango released dropped off his album, In The Comfort Of, back in March. It featured guests like JMSN, Xavier Omar, Smino and more. 21 Savage Joins FBG Duck For The Remix To "Slide"
SONGS Armani White & Sango Link Up On "Casablanco Freestyle"